Cabo Odger (OPV 84) offshore patrol vessel was floated out in August 2016. Image: courtesy of Gobierno de Chile. A close view of the bow section of the Cabo Odger (OPV 84). Image: courtesy of ASMAR Shipyards. The vessel is armed with an Oto Melara 76mm naval gun system. Image: courtesy of Darkone. Cabo Odger (OPV 84) is a new offshore patrol vessel built by ASMAR Shipyards, as part of the Danubio IV Project. 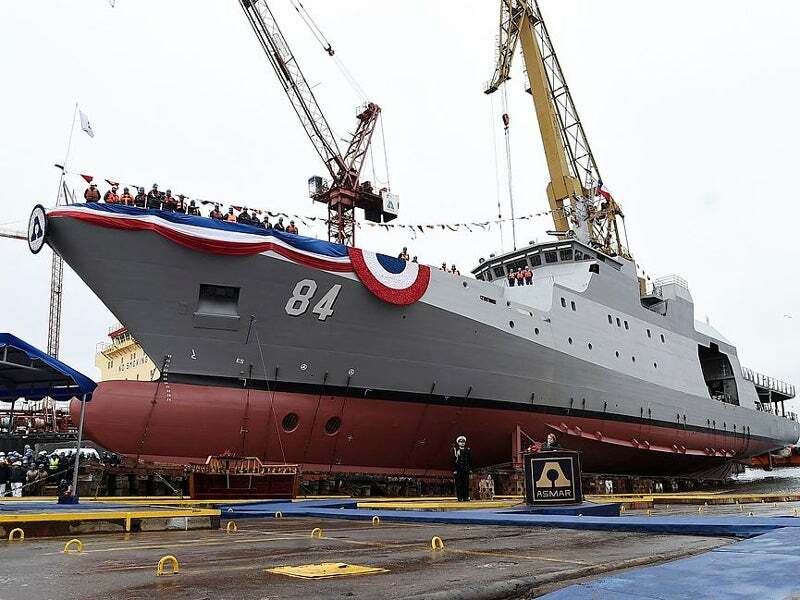 It is the fourth OPV in a series of six patrol vessels being built for the Chilean Navy. The keel for the OPV 84 was laid in July 2015. The vessel was launched in August 2016 and commissioned into service in August 2017. The first, second and third OPVs in the series were commissioned between 2008 and 2014. The OPV 84 can be deployed in a range of missions, including maritime patrol and surveillance, maritime interdiction, surface warfare in low-intensity conflicts, search-and-rescue (SAR), fisheries protection, and pollution control. The Cabo Odger OPV is based on the 80m offshore patrol vessel (OPV 80) design developed by Fassmer. The hull and superstructure of the vessel are made of steel, while the wheelhouse is constructed using marine-grade aluminium. The modular platform allows for the integration of various combat systems, rescue zone and launching ramp for interceptor boat. It can accommodate a range of surveillance payloads and three interceptor boats. The OPV demonstrates superior sea-keeping characteristics, making it suitable for multiple tasks in naval and coast guard missions. It features a functional deck layout housing a helicopter landing spot and hangar for a medium-sized helicopter, a large rescue zone, and a mission bay for modular payload. The helicopter deck can support the operations of a single helicopter with a maximum take-off weight of 10t. The deck is also mounted with a crane with a safe working load (SWL) of 4t at 10m outreach and a single-point davit with wave compensation. The vessel is capable of carrying 298m³ of fuel oil, 48m³ of fresh water, 270m³ of water ballast, 8m³ of lubricating oil, and 20m³ of aviation fuel. With an overall length of 80.6m, the vessel has a waterline length of 74.4m, moulded beam of 13m, and a depth of 6.5m to first deck. The full load displacement of the OPV is 1,728t. The patrol vessel offers accommodation for 60 personnel. "The weapon protects the OPV from incoming anti-ship missiles, low-flying aircraft, small boats, and ground-based threats." The OPV complies with the Safety of Life at Sea (SOLAS) and the International Convention for the Prevention of Pollution from Ships (MARPOL) standards. The main gun fitted on the bow deck is an Oto Melara 76mm naval gun. The vessel is also armed with two 12.7mm machine guns. The weapon protects the OPV from incoming anti-ship missiles, low-flying aircraft, small boats, and ground-based threats. The Cabo Odger OPV is equipped with a tactical radar, as well as BridgeMaster E X-band and S-band radars and electronic support measures (ESM). The navigation and communication systems aboard the vessel include warship electronic chart display and information set-up, warship automatic identification system, integrated bridge system (IBS), a global maritime distress safety structure – A3 (GMDSS-A3), and a data link. The OPV is powered by two Wärtsilä 12 V 26 diesel engines driving two controllable pitch propellers via Wärtsilä SCV 62 reduction gearbox. Each engine develops a power output of 4,080kW at 1,000rpm. Two 200kW bow thrusters are integrated on the vessel, while the shipboard electricity is supplied by three Caterpillar 3412 C generators, each with a rated power output of 435kVA at 1,500rpm. Emergency power supply is provided by a Caterpillar 3056 DIT 105kVA auxiliary gen-set. The propulsion system provides a maximum speed of 20kt at a maximum continuous rating (MCR) of 80%. The vessel can attain a maximum range of 8,000nmi at a speed of 12kt. The longest endurance of the OPV is 30 days. This project forms part of our recent analysis and forecasts of the global Naval Surface Combatants and Warfare Systems market available from our business information platform Strategic Defence Intelligence. For more information click here or contact us: EMEA: +44 20 7936 6783; Americas: +1 415 439 4914; Asia Pacific: +61 2 9947 9709, or via email. Get the complete picture with advanced radar processing solutions for coastal surveillance or port security from SSR.